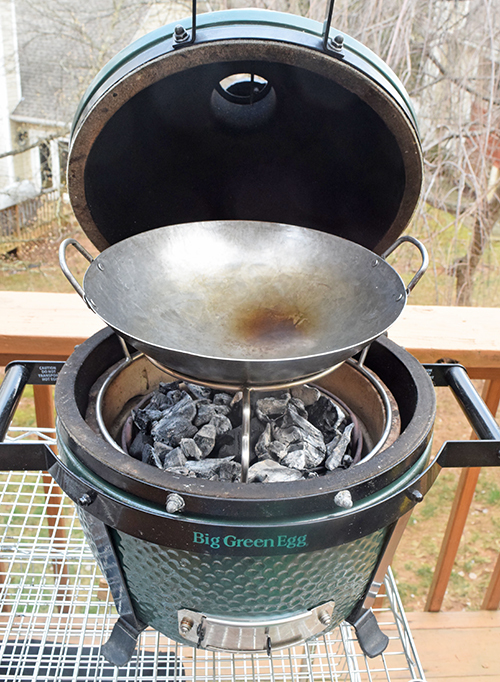 [FTC Disclaimer] I received no compensation for this post and have no affiliation with Big Green Egg or the Ceramic Grill Store. My sister gave me a Woo rig and a wok for my Mini-Max for Christmas. That was fantastic because while I have plenty of accessories for our large kamado grills, I haven't picked up many that fit the pint sized Mini-Max. 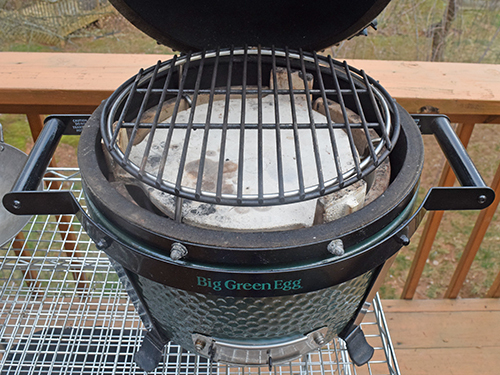 Woo rig (#150) and a 12" carbon steel wok for the BGE Mini-Max. Spider Rig - The most basic rig, the main use of this is to hold a stone to serve as a heat deflector. 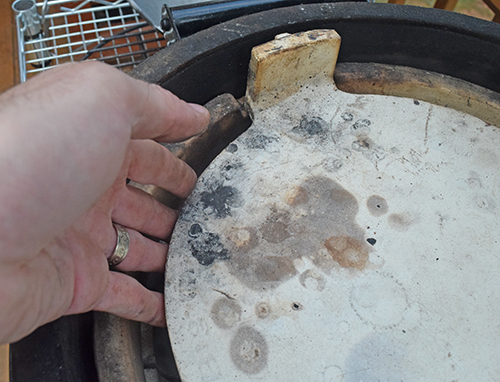 You can also flip them upside down (legs down, ring up) to hold a wok or raise a grill grate by an inch or so. Raiser Rig - I think of this as an advanced spider rig. It can hold a heat deflector, be used to hold a raised grate, or both at the same time. 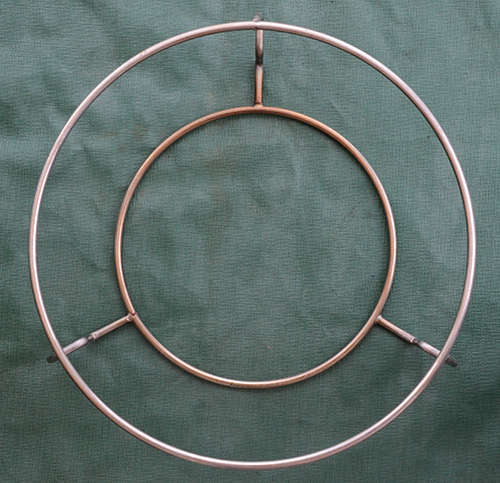 Roswell Rig - This holds two pizza stones at once, so you can cook two pizzas at once or it doubles your baking space if you are using your kamado grill as a wood fired oven. Adjustable Rig - The grand-daddy of rigs, in my opinion. We use them to get the optimum set ups during our BBQ competitions and at home I use them to double my capacity for big meats or even triple my capacity for ribs and wings. And that brings us to the Woo Rig, that my sister gave me. They make them for all kinds of kamado sizes but this specific one is the Woo 150 for the newer Mini-Max. If you have the first version of the Mini-Max you'd want the Woo 75, I believe. The Woo rig is made and sold by Ceramic Grill Store in Denton, Texas. This one for the Mini-Max runs right around $40. The Woo rig is useful as a wok stand, a raised grate rig, a heat deflector rig, and gives an easy way to move hot plate setters. The first thing I used the Woo for is as a wok stand. 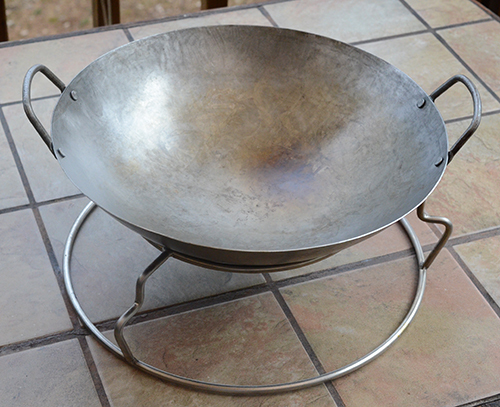 It holds the wok at the perfect height over the coals. I made stir fried spicy green beans to go with a grilled flank steak. That post is coming up. I love my Mini-Max, the size makes it so convenient. 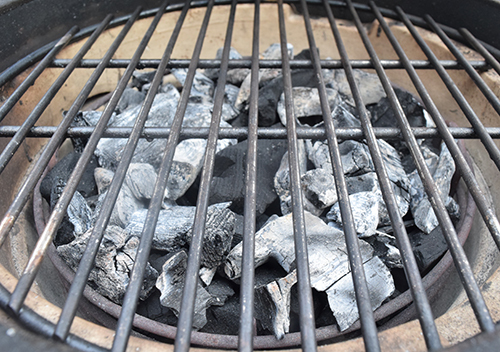 But it's compactness puts the grill grate super close to the coals. 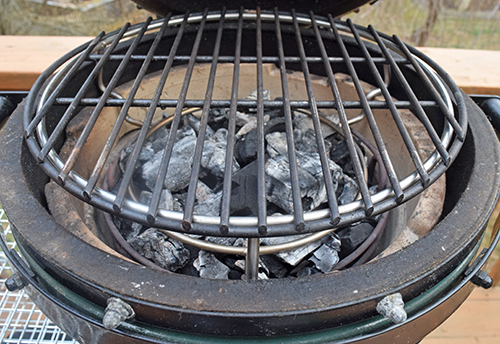 Here is a shot of my Mini-Max with a full Kick Ash Basket of coal and the grate on the fire ring. Being so close to the heat source exacerbates any hot spots. The Woo lifts the grate up right at 2.5 inches. This distance balances out the heat from below a bit. 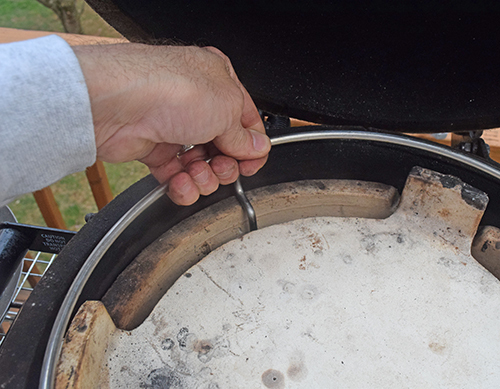 You can use the Woo to either hold a small stone or your plate setter to create an indirect heat set up in your small kamado grill. Mini-Max plate setter in a Woo rig. The rig raises your cooking grid about an inch above felt line - a bit higher than with the plate setter alone. This set up is good for smoking, baking, and fire roasting. The plate setter in a Mini-Max is a bit more difficult than the larger versions. The Woo rig fixes that issue. Without a Woo rig, you have to reach in like this to take the plate setter out. I don't have sausage fingers and I'm not wearing heat resistant gloves here (grill was cold, just demonstrating) but you can see how little room there is. Put your gloves on and it gets down right cumbersome sometimes. With the Woo rig in, you just lift up the edges of the rig and the plate setter comes out without any problems. Plenty of room to get an easy grip, even with the bulkiest of heat gloves. Again, the grill was cold, this was just demonstrating how it works. I'm quite pleased with the Woo rig for my Mini-Max. It has made it easier to handle the plate setter, cook raised direct, and stir fry on my Mini-Max. It definitely gives me options. Thanks for the rig, Rhonda!